I’ve tried many note apps but this is the one I use daily. I love the way I can make things private. I love the way I can save notes and pics to attach to the notes ( perfect for saving recipes). Easy to use and to share things with.... Cid. As a person who uses their devices to do work, not so much games, I've found this app useful to get organized and have resources close at hand. Totally recommend it. It is a good little tool to record a few ideas. Will have to use it a while to see if I need to get the premium version. Free app cut me off after a few recordings. Love the functionality of minimizing to record and then right back to typing on the app. There are other great imitators but this has always been my go-to. The one I always end up using when the others fail. Great product easy to use! I am now trying to transcribe and there is no easy pause button on my ear phones, or slow speed to listen and type at the same time. Maybe if transcriptions just happened or there was an easy program for that? I use this to keep track employee reviews and productivity tracking. Love it. 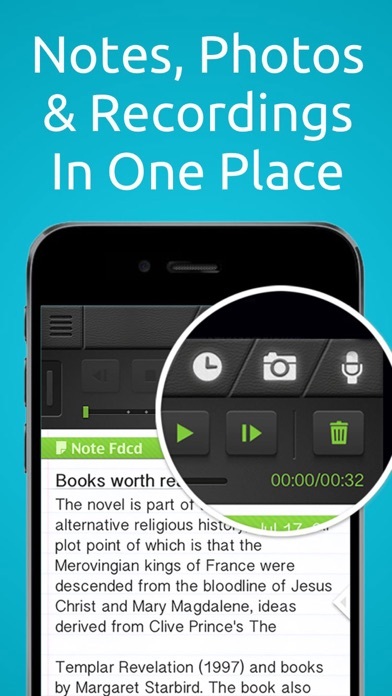 Amazingly excellent easy to use app for recording lectures, music, talks, or anything. Love it!! 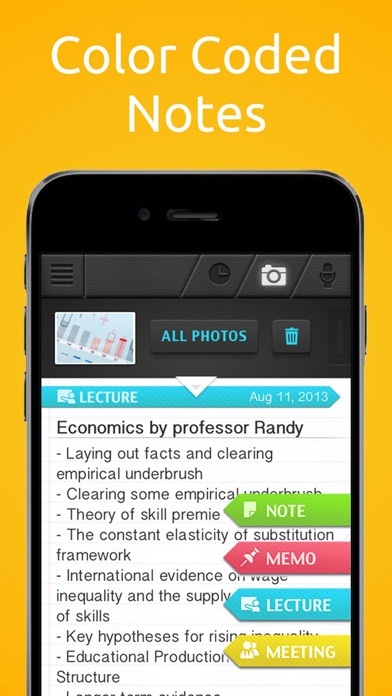 It is a good app to record lectures. However, I have to turn on volume all the way up to hear the records. I'd rate it a three star, except that for the price of $19.95 the App offers far less than similar Apps costing just a few dollars. Perfect repository of information. Written and audio. I love it. Super Notes are a life saver! Taking my parents to their Dr office visits can be inundating! All the different info and diagnosis’! This gives us an extra tool to know exactly what was told and make little to no mistakes about info! Thanks a million! I’m still new to the app but so far it’s real simple to use no bugs or issues so far it’s good. Grocery shopping is much easier, thank you! Not to mention appointments and just things to remember. Alpha system will not allow you to choose the different catalogues. App worked until I got a new phone. I paid for the upgrade and cannot access the upgrade on my new phone. Horrible customer support they never respond and if they do it’s a 3 word nonsense response. Find another note app unless you want to lose all your notes!! I like this app when I just got it, have not been using it as much as it is z bit slow. Over all the app works very well. I love the ability to have a passcode lock which prevents my kids from opening the app and deleting important data. The notes are stored safely. Very easy ease of use. Simple app but has many great attributes. The only con I have about this app is the inability to have the notes stored through the server and be available for multiple access Note accounts. 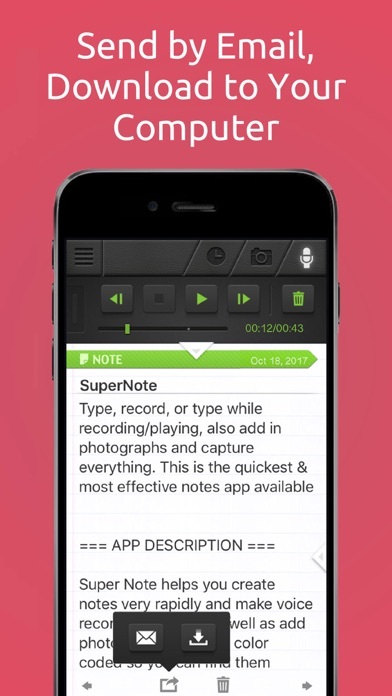 Meaning to have a feature where all notes/ recordings can be synced across all note Apps. Otherwise this is a great app and works well. Upgraded my phone and I lost all notes, lectures, everything. There were no warnings about this. I should’ve read the reviews. All other functions of this app work well. But be aware that if you upgrade your phone, you will lose everything on the app. There is instruction on how to share and transfer data but it’s definitely a hassle. The SuperNote help to stay focused and refer to what need to be done. And helps me with my prayers and bible verses. This is one of my favorite apps. Thank you for simplifying my work. Disappointed I can't add more audio files in FREE version. Omg , it’s so easy and comfortable. This app is simple yet efficient. Very helpful for memorizing and study needs. I used this app at a Convention that I attend. It record so clear that I was able to hear the small sounds even from the back of the room! I would recommend it! You get 4 notes on the free app. 4. Honestly. تم التجريب - سيئ . I record meeting notes so this has been super helpful esp when going back to tye time stamps. 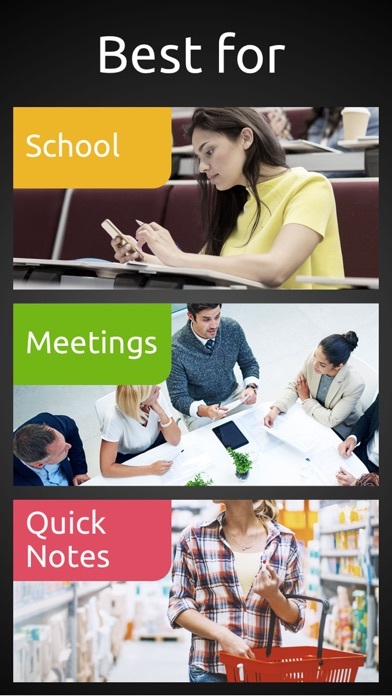 Great app- just what I needed for meetings. I wish I had found this app years ago. It allows me to take notes, take pictures and record at the same time. Perfect for almost everything I use it for. This is exactly the app I was looking for. I only want something that is simple and easy to use to record brief notes to my self and this one fits the bill. Using Siri on my iPhone it converts my recordings into text which is my greatest need. Thanks for putting together a great app at no cost to the user! In a life where I’m to busy for complications, this app makes it very easy to just get in and get out. I’m able to jot everything down and rely on the app to keep it safe for me! It’s easy to use and works wonders. I use it to record my lectures at university. This app is very helpful and useful. 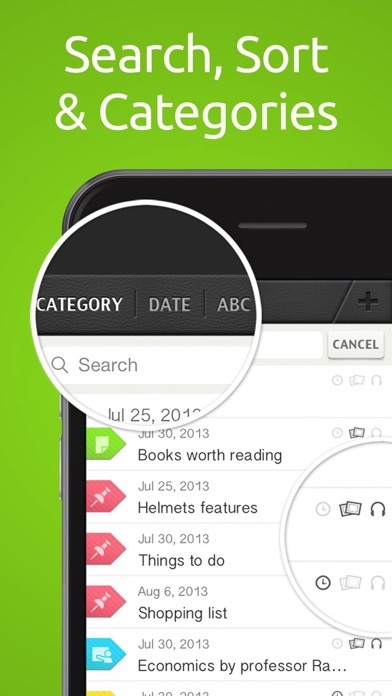 It is the best note taking app ever. I love it so much. This is truly a wonderful app for my daily musings and journal entries. At lunch, I welcome the chance to type short inspirational passages for my first grader to read at night, liberally using those high-frequency and age-appropriate words her teacher has assigned to her class for the week. I usually insert photos, cliparts, and short educational videos which my daughter finds relevant to her weekly lessons. I have been using it for years. For me!!! It’s the best !!!!! Use it in my A&P I class. Love that I can makes notes as I’m recording the lecture. Great study tool! I bought SuperNote a couple years ago and had access to as many notes I want. The new update asks me to enroll in a subscription a month. Email the company four days ago and still no response. Simple and easy to use. I like that you can add pictures.